Here’s a book I really, really, really don’t need to tell you about. It needs no introduction. No signal boost. I have no information that you haven’t already gathered, either from reading the book yourself or just from existing on the BookInternet for more than a few minutes in 2014. I could tell you that the library copy I read had bright yellow pages – on the edges. When our copies arrived at the library, I spotted them in the sorting bins from all the way across our large tech services area. Quite the dramatic entrance, book. I could also tell you that I really couldn’t put this one down – Andrew Smith works some serious storytelling magic here. Yes, this is a book about some teen boys who accidentally trigger the apocalypse and sic gigantic, man-eating grasshoppers on their sleepy Iowa hometown. And the narration is fairly audacious – Austin not only chronicles the events that lead to this disaster but also a family history, a local history, and the history of the other citizens of Earling. It’s definitely a weird book that takes some big narrative risks – but if you can stomach giant insects and keep up with the somewhat disjointed narration, the pay-offs are big. This book reads a little like a twisted textbook. Austin is writing a history here, and like any history, the telling belies the narrator’s biases, blind-spots, and priorities. It’s tough, at times, to tell what is more unbelievable and horrific: the events that Austin unleashes in Earling or his worldview. It’s impossible to ignore the fact that history, here, is written by a teenage boy. The stories Austin tells aren’t always nuanced or fair or appealing, but as a whole, the book raised some exceptionally interesting questions about who gets to write history, why they are allowed to take this privilege, and to what consequence. What does it mean when men get to tell the stories of all of civilization? At what point – if any – do the history writers stop being horny teenage boys and become authorities? But for me, that’s all set dressing. Behind the sci-fi-ishness and the voicey-ness and the ambition is just the juiciest realism I’ve read in quite some time. The scenes between Austin and his girlfriend and is best friend are just bubbling with tension as Austin seems to subconsciously test the limits of each relationship. I’m a realism-loving gal. 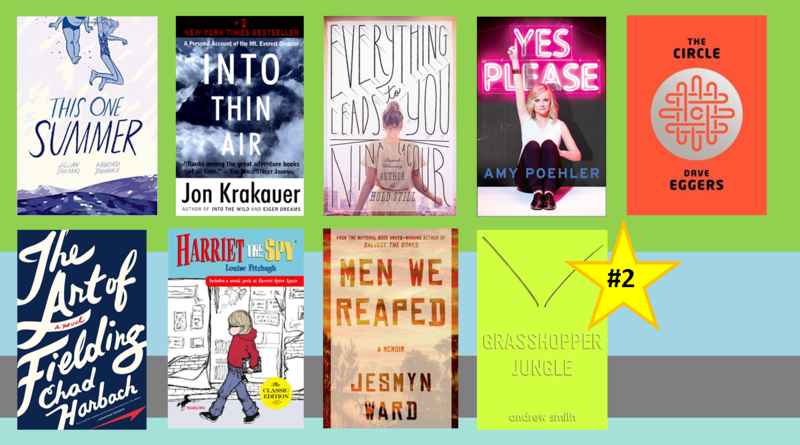 Even giant grasshoppers can’t scare me away from a good teen love story – especially when it’s the kind of love story that reveals just how huge and scary and delicate teen relationships can be. As the apocalypse grows imminent, Smith masterfully raises the stakes for Austin’s relationships, too – by the conclusion, how Austin reconciles his relationships with Shan and Robbie is just as important as how they can save the world. Maybe those two tasks are intimately connected. Maybe everything is.